I’ve gotten a quite a few questions about the food here. In a nutshell, the Americanized Chinese food is nothing like what is here. I’m getting the vibe that the people here don’t like sweet food the way Americans do. When I say I’m getting the vibe, what I mean is that I hear people say, “Too Sweet”. I would say sesame chicken, orange chicken and shoyu chicken…all would be ‘too sweet’. Also, eating is much more of a communal event, where dishes are all shared, and in some cases, tables are also shared with other people. The other night I was invited out to go to a Sichuan restaurant for some spicy food. I can’t describe how awesome this food was, but I’m going to try. No, I did not whip out my camera when we were eating, but I’m 100% sure pictures would not do the dishes justice. We started with Chrysanthemum tea, which is supposed to help take the spice away. I have so much to learn about tea, I mean, I didn’t even know you could drink Chrysanthemums. There were some relishes on the table that we started with. One dish was white carrot with red chilies and the other seemed to be red and green chilies with some kind of knuckle. We started off with some cold marinated chicken in a spicy sauce, along with some cool bamboo shoots, which I think calmed the burn. It was a favorite from one of the girls I was with, who had been there multiple times before. Cold chicken? Yeah, which was really good, because with the spicy sauce on top, it really evened out well. One thing I am not used to is the cold skin. Usually if there’s skin involved, we eat it all crisped up and fried, but I’ll learn to like it. We also had some Sichuan style stir fried frog. Mmm I have never had frog before, but it was really good. You know how people say everything that’s not beef or pork tastes like chicken? Well frog really does, but just softer. I’m sure some of you out there have had frog before, but this was my first time. I also have to mention that it was seasoned with this dry rub mixture, which was so flavorful that I accidentally got it down the wrong tube and I had to wipe my eyes and eat some rice, holy man did that burn. But burned so nicely. We had some sautéed diced chicken with chilies and peanuts, which was much more like what Americanized Sichuan food tastes like, but the chilies were a larger part of the meal. Lastly, we ordered some shredded potato and green pepper. The only way I can describe this texture is by saying they were tiny julienned potatoes that were cooked al dente. I learned everything in that last sentence on the food network, so please excuse me if this is really incorrect. I am not even sure potatoes can be cooked to al dente. All in all, the sauce that covered this was just so amazing. It was warm, mellow burn, with a hot aftertaste in some cases. It was sweet, lemony, gingery, peppery… I just don’t know how to tell you how it was. I feel like Stan’s dad from South Park right now, so I’m just going to stop. 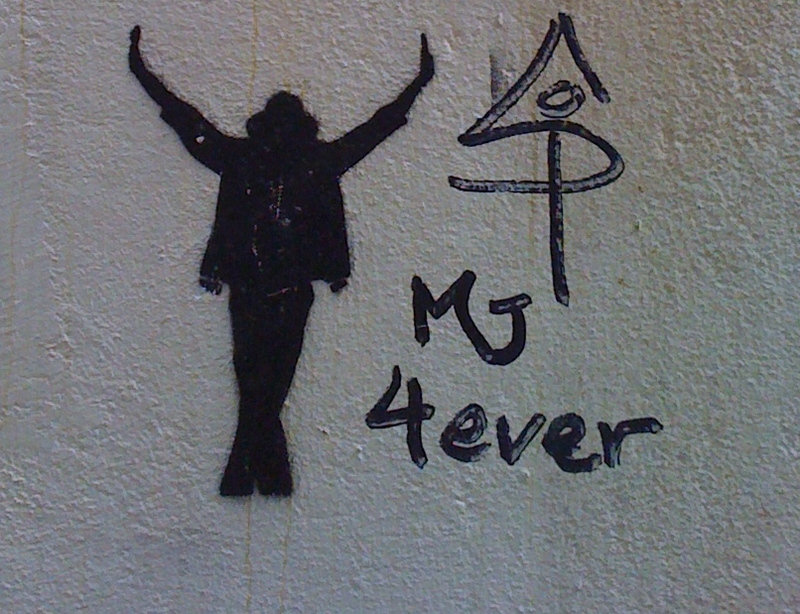 I didn't have a related picture, but thought this Michael Jackson stencil graf was pretty cool.